Flotteurs Airon Water Queen 5g"carnassier"
Flotteurs Soulor Water Queen 0 40g "coup"
Flotteurs Pep Water Queen 0 55g "coup"
One set of 4 premier pellet waggler floats. Super tough and the perfect pellet waggler for all your match, carp float fishing. Dinner bell for those all those carp. Loaded no-toxic float which will cast with ease and give that all important splash down after casting so ringing the. Gardner Tackle Suspender Float available to buy online fromFirst4Fishing. They look good for up in the water fishing for carp, chub as well detecting shy bites etc. Lineaeffe loaded insert floats taking 2BB as locking shot. 11cm Approx. 10 Loaded Fishing Clear Floats. 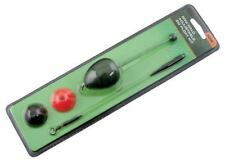 Lidsters Fishing Supplies LTD.
Gardner Tackle XL Suspender Float available to buy online fromFirst4Fishing. The rig also acts as an effective 'bolt rig' and bites are unmissable. Gardner Tackle H Blok Marker Float available to buy online fromFirst4Fishing. Simply drop the weight off the H-Blok and the line will automatically unwind off the float until the lead reaches the bottom, ensuring the marker is always fixed at the correct depth. 30 X Hair Rigs Barbless Size 6 8 10 Carp fishing Rigs 15lb Braid. 30 HAIR RIGS. 30 HAIR RIGS IN TOTAL. 32 pc in GREEN carp safety lead clip set. 2 X SIZE 6 BARBLESS HAIR RIG. 2 X SIZE 8 BARBLESS HAIR RIG. One set of 4 premier stumpy pellet waggler floats. Super tough and the perfect pellet waggler for all your match, carp float fishing. These stumpy pellet wagglers are perfect for very shallow water or casting right up to the far bank margins. Flotteur ultra sensible pour pêche à la carpe. Longueur 390 mm de couleur jaune. Flotteur très robuste. 8 x Carbon stem Shallow / Dibber Fishing pole floats. Coarse and Carp Fishing. 8 x Shallow / Dibber Pole Floats. Floats Style and Weight clearly marked on the float body. Fantastic quality Floats with Carbon stems. 8 x Carbon Stem Silver Slim Pole Fishing Floats. 8 xSilver Slim Pole Floats. Fantastic quality Floats with Carbon stems. Floats Style and Weight clearly marked on the float body. 500 Assorted Loaded Fishing Crystal Clear Waggler Floats. They look good for up in the water fishing for carp, chub as well detecting shy bites etc. This is a Wholesale Price. for a full box 500 floats. Lineaeffe loaded insert floats taking 7BB as locking shot. They look good for up in the water fishing for carp, chub as well detecting shy bites etc. 10 Loaded Fishing Clear Floats 19cm Approx. Lidsters Fishing Supplies LTD.
20 x WAGGLERS WAGGLER, flotteurs de pêche, carpe, pêche de MATCH, TACKLE, cours. WAGGLERS INSERTS. THESE ARE VERY EASY ON THE EYE. THE BB SIZES AND THE N.G.T. LOGO ARE PRINTED ON EACH FLOAT. 2 6BB 8" " 2 7BB 8.5" ". Lineaeffe loaded insert floats taking 5BB as locking shot. They look good for up in the water fishing for carp, chub as well detecting shy bites etc. 10 Loaded Fishing Clear Floats 15cm Approx. Lidsters Fishing Supplies LTD.
Each card has 3 different length extenders allowing you to customise the length of your hair without having to make another rig. 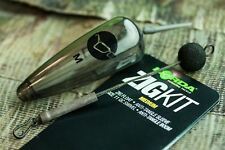 With chod and zig rigs becoming more and more popular. Chod Zig Rig Bin Box 10 EVA Winders NGT. Lineaeffe loaded insert floats taking 6BB as locking shot. They look good for up in the water fishing for carp, chub as well detecting shy bites etc. 10 Loaded Fishing Clear Floats 17cm Approx. Lidsters Fishing Supplies LTD. They look good for up in the water fishing for carp, chub as well detecting shy bites etc. 500 Assorted UnLoaded Fishing Crystal Clear Waggler Floats. A full Box Of floats. N ext G eneration T ackle Lidsters Fishing Supplies LTD.
Gardner Tackle Marker Float / Feature Finders (Pair) available to buy online fromFirst4Fishing. 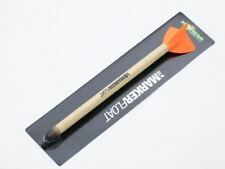 They are a great general purpose and feature integral flights with rounded edges that help them to rise up through sparse weed without catching up. THE BB SIZES AND THE N.G.T. LOGO ARE PRINTED ON EACH FLOAT. THESE ARE VERY EASY ON THE EYE. 8 x Carbon stem Dibber Fishing pole floats. Coarse and Carp Fishing. 8 x Dibber Pole Floats. Floats Style and Weight clearly marked on the float body. Fantastic quality Floats with Carbon stems. You will receive the following floats. They look good for up in the water fishing for carp, chub as well detecting shy bites etc. Lidsters fishing loaded insert crystal wagglers. 100 x Loaded Inserted wagglers. 100 x Loaded wagglers. 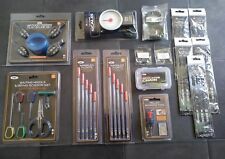 Lidsters Fishing Supplies LTD.
Dibbers: 4x8, 4x10, 4x12, 4x14. Carp Float: 4x14, 4,16, 0.75g, 1.0g. Floats Style and Weight clearly marked on the float body. All floats have Carbon stems. Worm Float: 4x12, 4x14, 4x16, 0.75g. 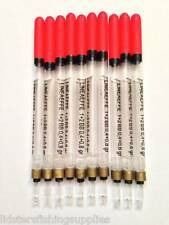 8 x Carbon Stem Pole Fishing Floats - Designed for Pellet Fishing. 8 Pole floats designed for Pellet Fishing. 8 x Pellet Floats 4x12, 4x14, 4x16, 0.75g (You will receive 2 each of the sizes listed). Fantastic quality Floats with Carbon stems. 8 x Carbon Stem All Rounder Pole Fishing Floats. 8 x All Round Pole Floats. Floats Style and Weight clearly marked on the float body. 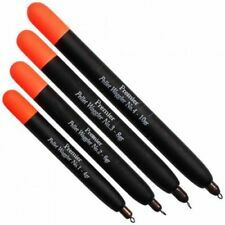 Gardner Tackle Seeker Marker Float available to buy online fromFirst4Fishing. The ultimate marker float for pinpointing features and hot spots. Supplied with a pair of coloured screw on flights to suit different light conditions: Black - for bright conditions where a light coloured float doesn't stand out against the glare of bright light reflecting off the lake. Carp Float 4x14, 4,16, 0.75g, 1.0g. 20 x Carbon Stem Pole Fishing Floats. All floats have Carbon stems. Floats Style and Weight clearly marked on the float body. Worm Float 4x12, 4x14, 4x16, 0.75g. 8 x Carbon Stem Worm Pole Fishing Floats. 8 xWorm Pole Floats. Fantastic quality Floats with Carbon stems. Floats Style and Weight clearly marked on the float body. 8 x Carbon Stem Carp Pole Fishing Floats. 8 xCarp Pole Floats. Fantastic quality Floats with Carbon stems. Floats Style and Weight clearly marked on the float body. La liste des favoris ! MPN Does Not Apply. EAN Does not apply. Livré avec rotation & Speed ​​Link pour la fixation facile du cordon. MPN CAC424. Liens utiles. Autres détails S'il vous plaît noter Betalight Slots. une visibilité maximale. Liens utiles. Autres détails Les vols sont très en-viz orange ou jaune Alors vous pouvez les voir sur de longues distances. Avec une grande visibilité Vols. Mini Halo Zig Float Présentation. Le Halo bien pensé est conçu pour une utilisation avec des fils de 2 oz (56g) et ci-dessus et est livré avec une grande visibilité interchangeables cônes de nez rouge et noir, ce qui rend beaucoup plus facile de voir le flotteur Zig lors de la pêche à distance. Model Suspender Float. Maintenant encore plus fort avec des manchons en caoutchouc coniques ajoutés pour renforcer la tige. EAN 5060128603700. Fishing Technique Carp. Chaque flotteur est moulé par injection d'air pour une performance optimale à la fois dans la colonne d'eau et dans l'air par aérodynamique. - Matériel de flotteur: EVA, plastique. - Matériel de perle: Plastique. Maintenant encore plus fort avec des manchons en caoutchouc coniques ajoutés pour renforcer la tige.